Tweaked the user interface a bit, partly to improve responsiveness after 10000 or so haiku have been found. Made the list of haiku stay scrolled to the bottom so you can see the new ones as they’re found. Added a progress bar instead of the spinner that was there before. Changed a setting so it should work in Mac OS X 10.6, as I said here it would, but I didn’t have a 10.6 system to test it on, and it turns out it does not run on one. I think 10.7 (Lion) is the lowest version it will run on. Added some example text on startup so that it’s easier to know what to do. Made it a Developer ID signed application, because now that I have a bit more time to do Mac development (since I don’t have a day job; would you like to hire me? ), it was worth signing up to the paid Mac Developer Program again. Once I get an icon for Haiku Detector, I’ll put it on the app store. Fixed a few bugs and made a few other changes relating to how syllables are counted, which lines certain punctuation goes on, and which things are counted as haiku. That last item is more difficult than you’d think, because the Mac speech synthesis engine (which I use to count syllables for Haiku Detector) is very clever, and pronounces words differently depending on context and punctuation. Going through words until the right number of syllables for a given line of the haiku are reached can produce different results depending on which punctuation you keep, and a sentence or group of sentences which is pronounced with 17 syllables as a whole might not have words in it which add up to 17 syllables, or it might, but only if you keep a given punctuation mark at the start of one line or the end of the previous. There are therefore many cases where the speech synthesis says the syllable count of each line is wrong but the sum of the words is correct, or vice versa, and I had to make some decisions on which of those to keep. I’ve made better decisions in this version than the last one, but I may well change things in the next version if it gives better results. Though in a different context, where – is a minus sign, and meant to be pronounced, it might need to go at the start of the next line. Greater-than and less-than signs have the same ambiguity, as they are not pronounced when they surround a single word as in an html tag, but are if they are unmatched or surround multiple words separated by spaces. Incidentally, surrounding da-da in angle brackets causes the dash to be pronounced where it otherwise wouldn’t be. I also discovered what I’m pretty sure is a bug, and I’ve reported it to Apple. If two carriage returns (not newlines) are followed by any integer, then a dot, then a space, the number is pronounced ‘zero’ no matter what it is. You can try it with this file; download the file, open it in TextEdit, select the entire text of the file, then go to the Edit menu, Speech submenu, and choose ‘Start Speaking’. Quite a few haiku were missed or spuriously found due to that bug, but I happened to find it when trimming out harmless whitespace. I could play with this all day, or all night, and indeed I have for the last couple of days, but now it’s your turn. 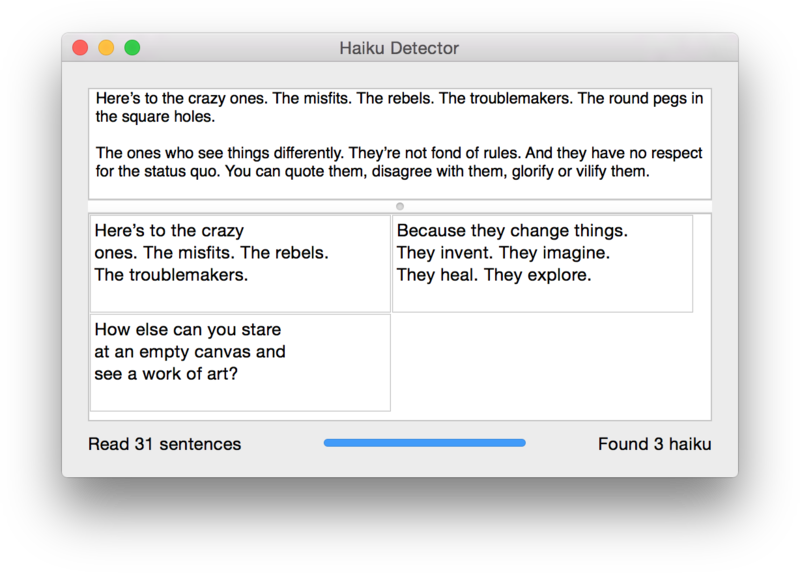 Download the new Haiku Detector and paste your favourite novels, theses, holy texts or discussion threads into it. with most of our brain. in the brain,” he says. I’d like to thank the people of the xkcd Time discussion thread for writing so much in so many strange ways, and especially Sciscitor for exporting the entire thread as text. It was the test data set that kept on giving. This entry was posted on May 18, 2015, 3:04 am and is filed under Haiku Detector. You can follow any responses to this entry through RSS 2.0. You can leave a response, or trackback from your own site.